Hi folks, Doc here. 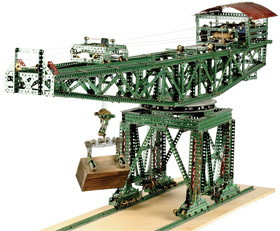 Of all the metal construction toy systems documented and discussed here on Girders & Gears, Meccano® is arguably the most popular system worldwide that was ever produced. As such, it has been documented and profiled in great detail numerous times and in numerous locations. With that in mind, this article is only intended as a very brief look at this great system. Meccano, Like all similar construction toys, utilizes a standardised system of reusable metal parts, including perforated strips, girders, wheels, rods, brackets, pulleys, sprockets, gears, electrical parts, motors, and other specialised parts. These parts could be attached to one another with screws and nuts, using only a screwdriver and wrench (spanner).The Meccano system, like the Gilbert Erector system, is based on a standard hole spacing of ½", or 12.7 mm. The standard thread is 5/32". Axle rod diameter is 0.160", or 4.04 mm. Gears typically have 38 teeth per 1" diameter. Meccano was invented by Frank Hornby in England in 1901, and it quickly spread throughout the world. By 1910, Meccano sets were being imported into the United States, and a U.S. Meccano Company was formed in 1913. Coincidentally, A.C. Gilbert created his famous Erector system at this same time. 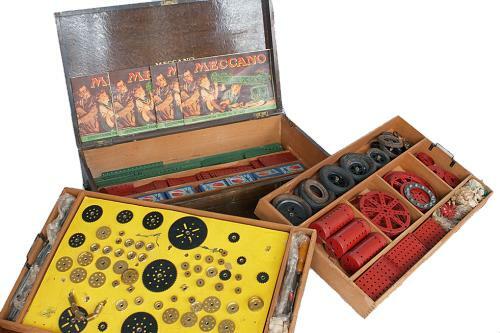 In 1922, a new Meccano factory in Elizabeth, New Jersey began manufacturing the sets. In 1929, Gilbert purchased the U.S. Meccano Company, and the factory closed shortly thereafter when Gilbert moved Meccano production to his Erector factory in New Haven, Connecticut. The new Meccano sets, which Gilbert called "American Meccano", continued in production until 1938. It is unclear why Gilbert decided to cease production of his American Meccano, commonly known today at Gilbert-Meccano. Meccano continued to be marketed and sold outside the US by Hornby's manufacturing plant in England. 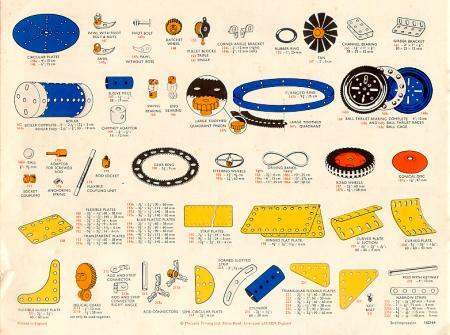 At some point, importation of Meccano into the U.S. began again, at least in limited quantities, and sets began to appear in Sears and Roebuck catalogs around 1960. The original Meccano plant in England closed its doors in the late 1970's, but Meccano continued to be manufactured by a plant in Calais, France. In an ironic twist of fate, the Meccano company acquired the Erector name and trademarks in the late 1980's. 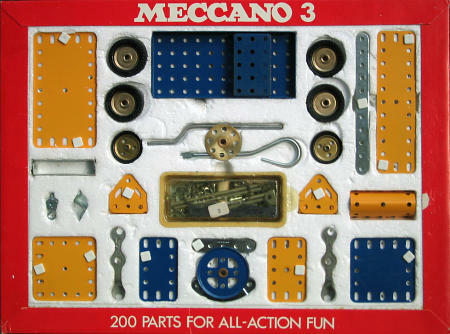 Meccano SA itself was purchased by Nikko Toys of Japan in May, 2000. In 1964 Meccano made some radical changes to their color scheme by replacing the red and green parts with new "modern" colors of silver, yellow and black. The yellow and black were inspired by the spate of freeway building that was taking place at the time. At this point the silver strips and girders were actually sprayed with aluminum paint, which proved less than durable. Zinc plating replaced the spray finish in 1966. Some additional parts were added from Set No. 4 upwards and the No. 9 "Master Engineers" set was discontinued. A number of new sets were also introduced such as the 3M (4.5v motor added), 4M (with motor and battery box), 4EL (with Elektritrik Kit parts) and the 5ME Meccano Set (with 3-12 volt reversible motor, 6 ratio gear box and Electronic Control set). Thirdly, the packaging underwent major changes of style and color based on dark blue with silver and red (see image above). The silver later changed to white, as it was easier to print. The dark blue is prone to scuffing, which detracts from its appearance over time. The inserts were molded polystyrene (see photo below). These colors and style remained in place until 1978 when the colors of parts were again changed dramatically to dark blue and yellow. However, in 1976 the packaging was changed with new box lids reflecting a unisex approach with boys and girls playing with Meccano - but this was soon dropped. The other theme during the 1970's was the introduction of specialized sets. These included the No. 1 and No. 2 Clock kits and the Army and Highway Multikits. These kits contained new and specialized parts and in the Multikit contained parts in olive green and yellow respectively. The introduction of new sets in 1978 were the last to be produced by Binns Road - the home of Meccano and the end of an era. Below is the Meccano No. 3 set from 1976-77. 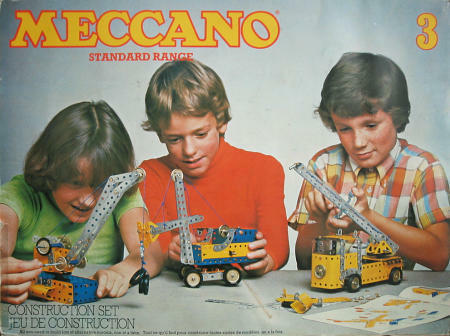 It's special, and quite collectible, because of its "unisex" box art: this was the first and last time that both boys and girls were featured on a Meccano set. The No. 3 has 200 parts arranged in a single molded polystyrene insert. In the early 1990's, Meccano sets bearing the Erector name were imported into the U.S. by Irwin Toys. 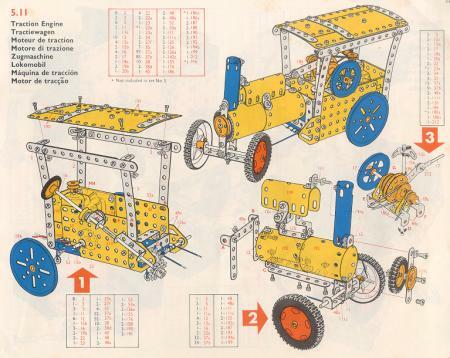 By 1999, Irwin had ceased importation of Meccano-Erector into the U.S. except for the plastic Erector Junior. 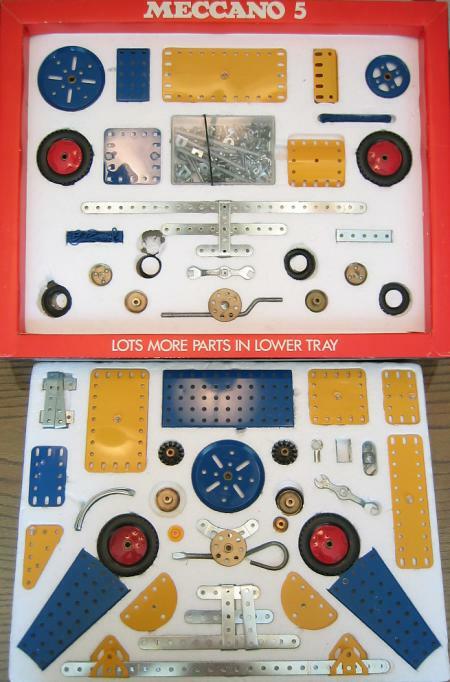 Today, many of these same Meccano-Erector sets, along with several new ones, are being marketed in the U.S. by the Nikko Corporation. 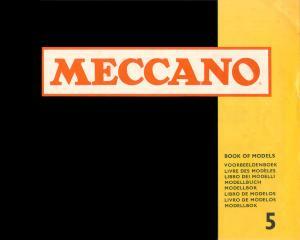 Today, the name Meccano has practically become a household word. Meccano clubs exist in many parts of the world, and exhibitions are regularly held. 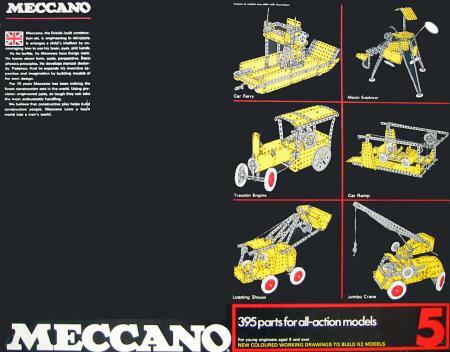 In addition, Meccano is probably the most documented metal construction toy system on the Web. 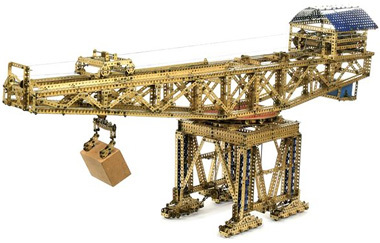 There are too many sites to list here, but a good place to start for more in-depth information is on the Meccano Web Ring home page.